I don't understand the hype. Yeah some of the colors are nice, but the product smells like plastic. The texture is just alright--not slick, not sticky. But it wears about the same as any other gloss. I have three and I'm regretting that I ever bought them. No way am I shelling out $23 on a NARS gloss ever again. i really liked this lipgloss. it wasnt too sticky and it had great pigment. the shine wasn't overbearing. basically, my lips looked great. i wore it one day to an event, and maybe i put too much on, but it caked on me. it was not cute at all! 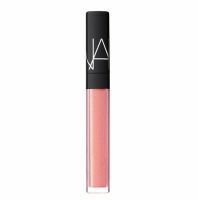 i love nars lipgloss, but you only need a little or else it can cake upp! I decided to try this after many rave reviews on Nars O*****. I do like the color. It's shimmery and a really nice coral color and the shimmers are not too chunky. However, I didn't find this lip gloss spectacular. I feel like you can find something similar at the drugstore for a way cheaper price. The only time I would splurge on lip products is if I can't find any dupes for this but in this case...read more I think I can (although I haven't found a dupe for this color unfortunately, just the texture). This kind of reminds me of NYX Aqua lip gloss but just not as glittery. I like how this is completely unscented since I hate perfumey lip products. I don't taste the plastic taste like what other reviewers noted. I think it doesn't taste like anything at all. A plus! It's not too sticky and it feels really comfortable on the lips.